"A frozen concoction of your favorite fall pie! This is great served with crushed gingersnaps." Heat half-and-half in a saucepan over medium-low heat to just below a boil, about 5 minutes. Beat egg yolks, sugar, and vanilla extract together in a bowl using a whisk until smooth. Gradually pour half-and-half into egg mixture to temper the eggs; add pumpkin pie spice. Pour the half-and-half mixture back into the saucepan; cook and stir over medium-low heat to just before boiling until mixture thickens, about 10 minutes. Remove saucepan from heat and beat pumpkin and whipping cream into half-and-half mixture until smooth; strain through a fine-mesh strainer into a bowl. Refrigerate pumpkin mixture until completely chilled, at least 1 hour. 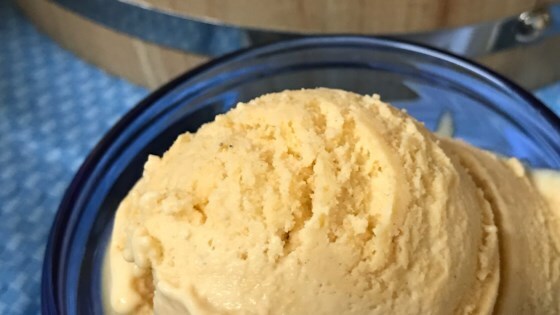 Transfer pumpkin mixture to an ice cream maker and follow manufacturers' instructions for making ice cream.